Cop A Hit (blue) was disqualified from race 2 at Bulli on December 15, 2018. 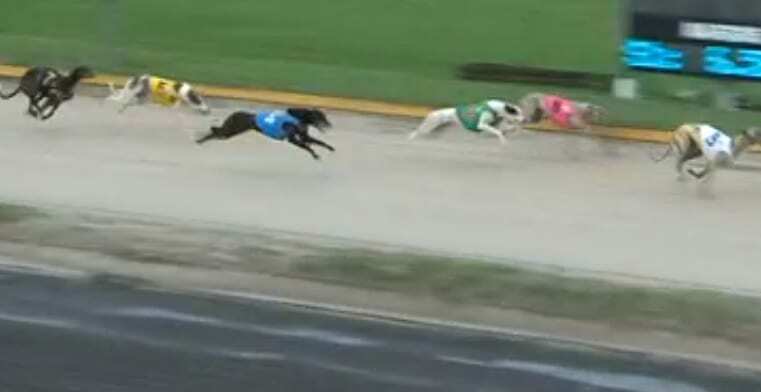 THE Greyhound Welfare & Integrity Commission announced on Monday it has disqualified Cop A Hit from a race at Bulli late last year after it was found to have been misidentified. The confusion between the administrative body and the dogs pertains to the ear identification. Cop A Hit was registered under the ear brand NGDJG, while the unnamed dog possessed the brand of NGDJJ. Trainer Jason Magri, presented the dog with the JJ brand as Cop A Hit at Performance Trial on 1 December 2018. The stewards allowed the dog to trial under the wrong name but alerted Magri to the mistake in paperwork. Following the trial the stewards lodged paperwork with Greyhounds Australasia to change the branding associated with Cop A Hit from NGDJG to NGDJJ, but failed to implement the changes prior to the Bulli meeting on December 15. As a consequence the the dog branded with the NGDJG ran as Cop A Hit, failing to place in a maiden event over the 400m journey. The papers presented by the trainer at Bulli on 15 December 2018 contained the endorsement from stewards that there was an anomaly with the identification of the greyhound. Following the conclusion of the inquiry the commission found that Magri had done nothing untoward and that the mistake was due to an administrative error. They subsequently disqualified the dog from the event and rectified the issue between NGDJJ and NGDJG. Furthermore, the commission has taken additional steps to ensure a similar incident does not occur. Not permitting a greyhound to race or trial on the first occasion without an identification card issued by a controlling body. If an irregularity is identified, the greyhound, the subject of the irregularity, will automatically have their nominations rejected. All greyhounds presented to race or trial are identified by Commission stewards in addition to all other identification procedures. An excerpt from the commission’s findings read: “The Commission accepts responsibility for the error that allowed the greyhound to race, and has since taken an audit of the process and implemented a new procedure to ensure all greyhounds are correctly identified prior to racing or trialling.